The research programme will be divided into six tasks, each contributing to one or more sub-goals. KnowRISK comprehends essentially two main blocks of activities, namely Research for Action and Action for Prevention. Three interrelated activity lines, included in the Research for Action block, will produce the input of knowledge to be delivered to communities in the 3 participating countries and pilot areas (Action for Prevention block). 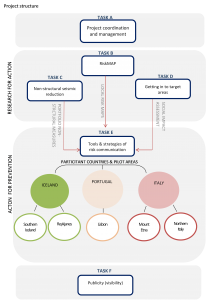 The first line of activity is devoted to the definition of seismic scenarios critical for non-structural damage in each participant country (Task B) and will be flanked on one side by a line that will produce a Portfolio of non-structural measures (Task C), and on the other side by a line that will investigate the level of awareness in specific communities (Task D) so that risk communication will take into account the social and cultural background. A systematic compilation of non-structural seismic protection actions in Task C will lead to the development of a Portfolio of good practices to reduce most common non-structural vulnerabilities. This will be achieved through a “cross-knowledge” strategy between previous research, evidence of damage caused by non-structural elements in previous earthquakes and the input from experience in the area of non-structural damage prevention. Assessment on the level of awareness of the importance of non-structural procedures by owners and construction practitioners (Task D) will be built through the application of survey/quiz techniques, namely using new web communication tools. It is of particular importance to have research areas with a different history of disaster experience to implement a community-based disaster risk reduction approach. Through this diversity, we intend to create opportunities of mutual learning between practitioners and end-users. In the Action for Prevention block risk communication strategies and participatory approaches will be used to raise awareness towards non-structural risk mitigation and improve adaptive capacity of citizens to hazard (Task E). This communication, by means of simple and low cost actions, is strongly underestimated by most people around the world. KnowRISK will be implemented in society groups that have specific exposure to non-structural vulnerability, namely schools, households and general public as a whole and the effectiveness of strategies will be estimated in both short- and long-terms. Dissemination of good practice and scientific achievements within the project (Task F) will be essentially targeted to these groups.